The Kensington Kinetic Sculpture Derby is now in its ninth year of wacky fun. What do you get when you take a few bikes, throw in some human power and add art? The 9th Annual Kensington Kinetic Sculpture Derby, a parade of vehicle floats that runs through the neighborhood to a bevy of spectators each year. 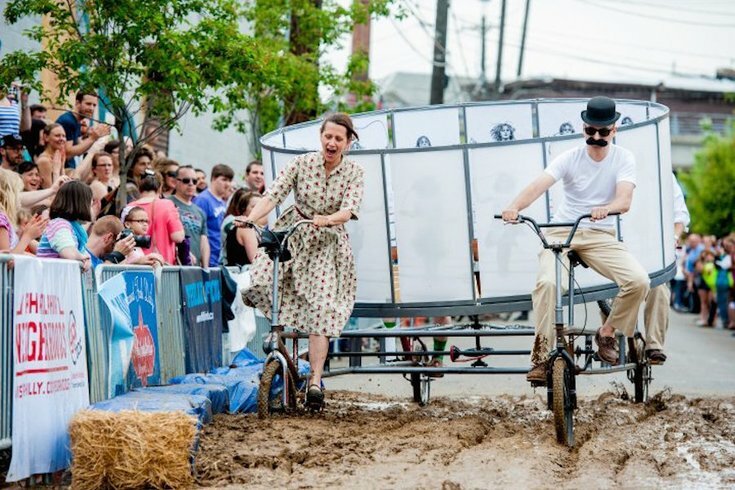 On Saturday, May 16, residents from Kensington and the Philadelphia community will run their handmade, human-powered vehicles through a 3.6-mile course through a foamy "car wash," through sand and over cobblestones and, finally, through a mud pit. Vehicles run the gamut from sculptures towed by bicycles to multi-person tandem bikes. Each pilot or pit crew member must be dressed in a costume related to the artistic theme of their vehicle, and each vehicle must meet required safety codes. Each kinetic sculpture will be judged, and prizes will be awarded in a plethora of categories from best costume to worst pun. Teams can be of any size but must have only up to 12 pilots per vehicle, and they must register by May 1. After that, the creativity is boundless, and KKSD does a pre-derby workshop series for those looking to learn new skills. Presented by Philadelphia Brewing Co., two of these workshops are coming up: One is on fabrication and the other on troubleshooting. KKSD is definitely a spectator sport, and there will be plenty to look at. Before, during and after the derby, however, the 10th Annual Trenton Avenue Arts Festival will be open. More than 200 local artists, makers and vendors will be out and about from 11 a.m. to 6 p.m., and live music will be playing. Both events are kid-friendly and open to the public.